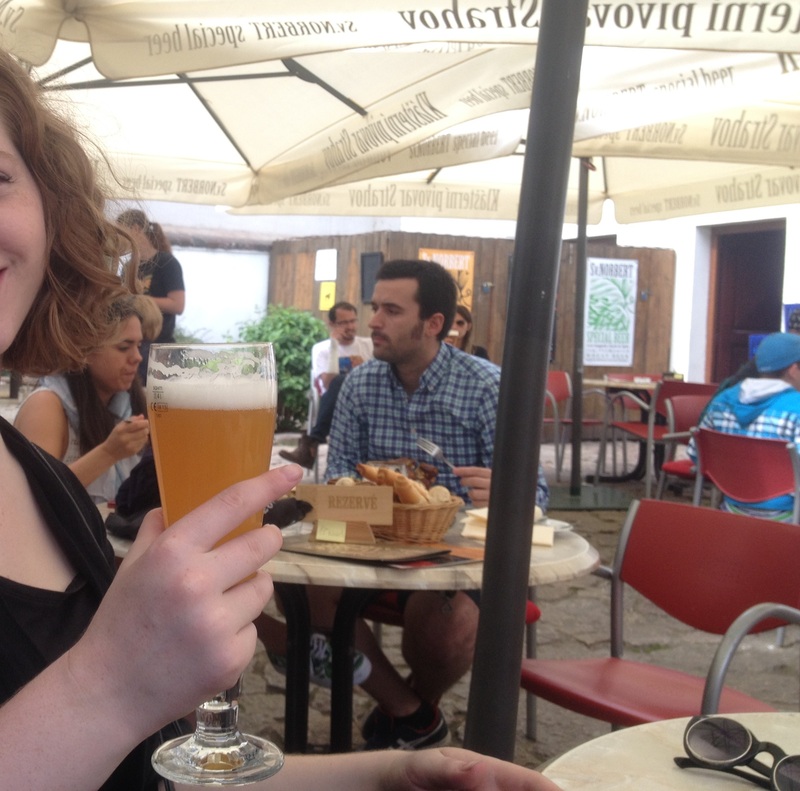 Czech beer is good – and cheap. Guidebooks breathlessly proclaim that in the Czech Republic, beer is cheaper than water. That’s not entirely accurate. 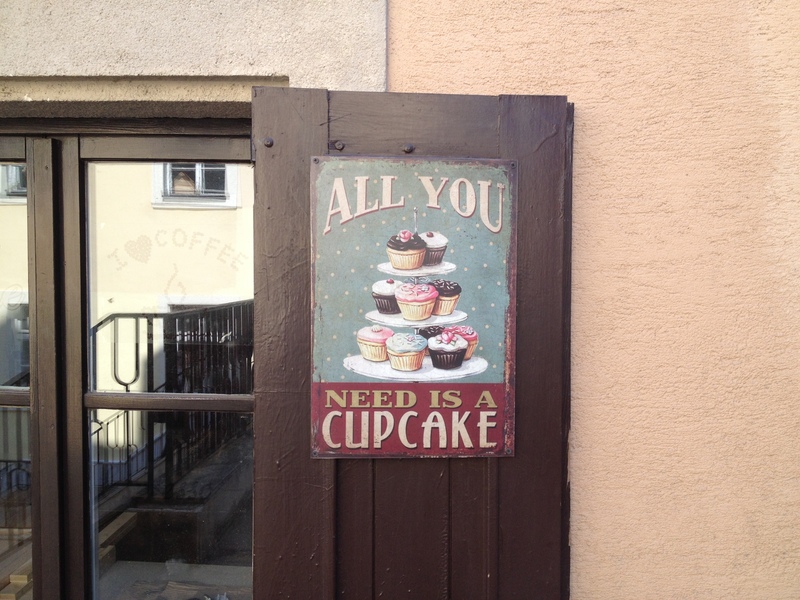 Despite warnings that nothing in the Czech Republic is free (including – gasp! – ketchup packets at fast food restaurants), we found that we could in fact ask for and receive complementary tap water in restaurants and cafes. (For our first few days, in thrall to the guidebook warnings, we demurred offers of water and left bread baskets untouched. We were idiots.) But, yes, a small (0.3L) beer is generally cheaper than a bottle of water. And while pilsners are the favored style, we also enjoyed yeasty dark beers; cloudy, funky wheat beers; sour cherry beers with a fruit at the bottom; even the odd IPA. We drank beer in pubs and restaurants, under tents, at street markets, in monasteries and parks (we did not drink beer on the tram, though we saw others doing so). Bottom line: we drank a lot of beer. Czech wine and cider are also good – and cheap. How could we resist the “InCider Bar,” just down the block from our hotel? (Magnetic Apple cider – which as far as I can tell, is unfortunately not exported to the U.S. – became our favorite. )* And we had begun to sample Czech wines (including at a charming wine bar in Prague’s Karlín district) even before we met up with the one-man Czech Wine Promotion Authority who happened to be staying at our guesthouse in Bohemian Switzerland. This was the same helpful fellow who showed us how to check in when we arrived from the Děčín train station, tired and disheveled and all-too-aware of our nonexistent Czech language skills, to find the reception office closed (just go into the kitchen and ask for Michelle). We saw lots of him over the next few days. For example, on the picturesque boat that ferries hikers through an otherwise inaccessible section of the Kamenice River gorge: while the burly ferryman kept up a steady patter in Czech about the fairytale creatures we could see in the rocks, replete with jokes that had the Czech passengers in stitches, our friend kept up a steady patter in English on the delights of Czech wine (“everyone knows about our beer, but bah – that stuff just goes straight in the toilet . . . it’s our wine that’s really great, and no one knows about it”). Prague has lots of hills. 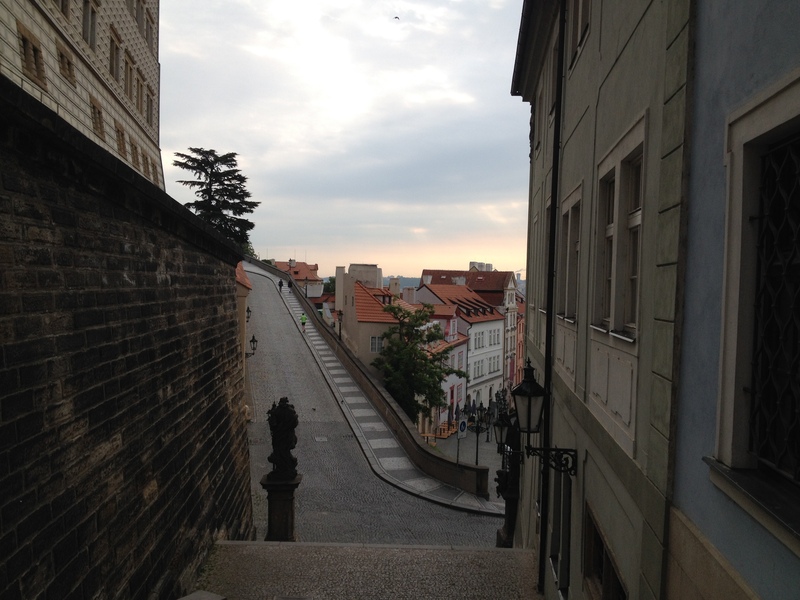 I knew, of course, that Prague Castle is on a hill looking down at the city, the way castles generally do. And I knew vaguely that there are a number of parks in Prague and that some of those parks involve hills. And wasn’t there some sort of national monument up on a hill as well? But I imagined that under and around those hills, the city sprawled out in flat normalcy. Pause, here, for the laughter to die down. 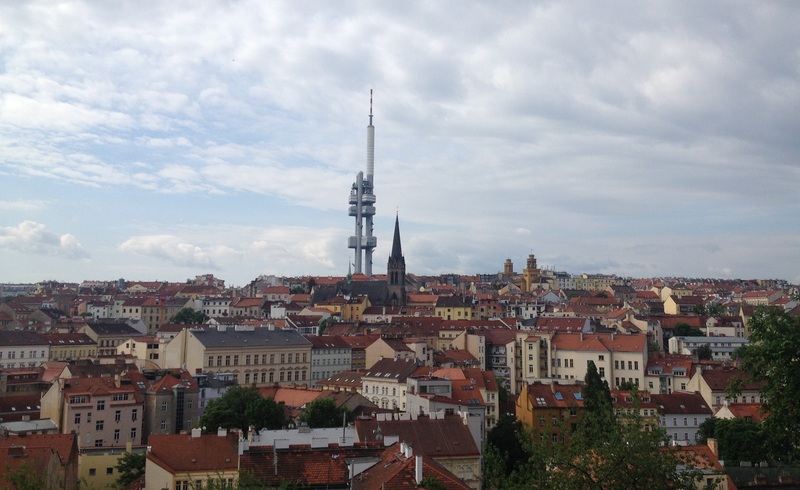 The thing (or, more accurately, one of many things) I didn’t understand about Prague is that it’s nothing but hills. One could, perhaps, stay on flat ground by hugging the banks of the Vltava, but you’d have to get there first – and forswear anything away from the river. Walking from our hotel on Kodaňská down Francouzská to Náměstí Míru? That’s a series of hills. From Vinohrady to Žižkov? Hahahahaha, a serious hill! 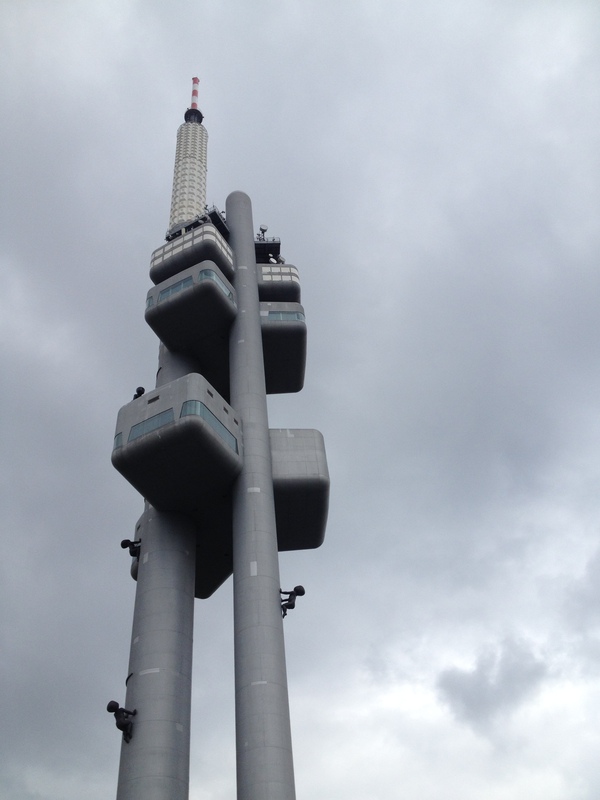 Venture deeper into Žižkov, what will you find? More hills! And forget about continuing from Žižkov into Karlín on foot, no matter how close the two neighborhoods appear on a two-dimensional map. I’m happy to say that those hills had a positive impact on my running. 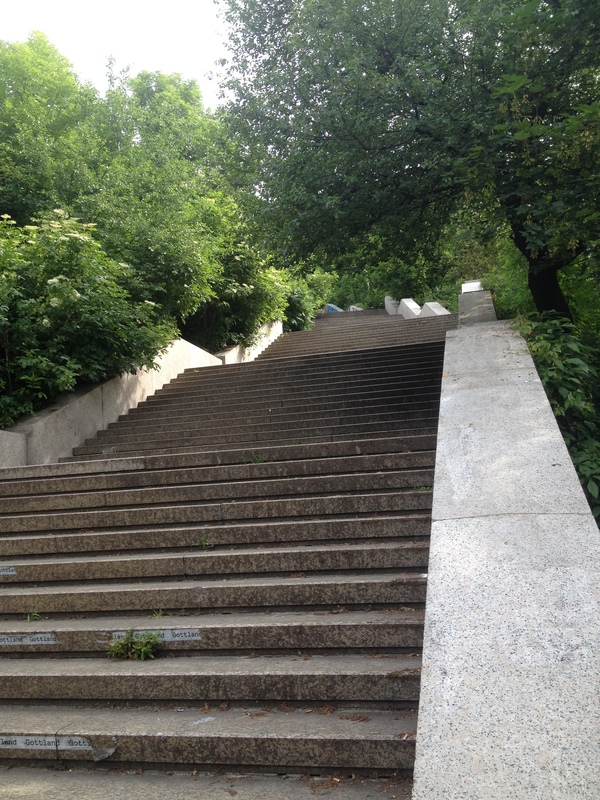 Each morning of our trip, I meandered up and down and around the city on leisurely, stop-and-go sightseeing jogs. No speedwork, no tempo runs, no serious distances, none of the staples of my usual training regimen. And yet, back in Brooklyn, when I headed out for a “welcome back” loop of Prospect Park, I felt as though I had wings on my feet. Other things Prague has lots of: clocks, dogs, smokers and babies. I’ll start with clocks. The astronomical clock in Old Town Square gets all the press, and without a doubt, it’s spectacular. But it has plenty of horological company. Being in Prague means never having to check your watch: there are clocks on church towers, clocks on lampposts, clocks in pubs and on public buildings, baroque clocks and art nouveau clocks and modernist clocks. 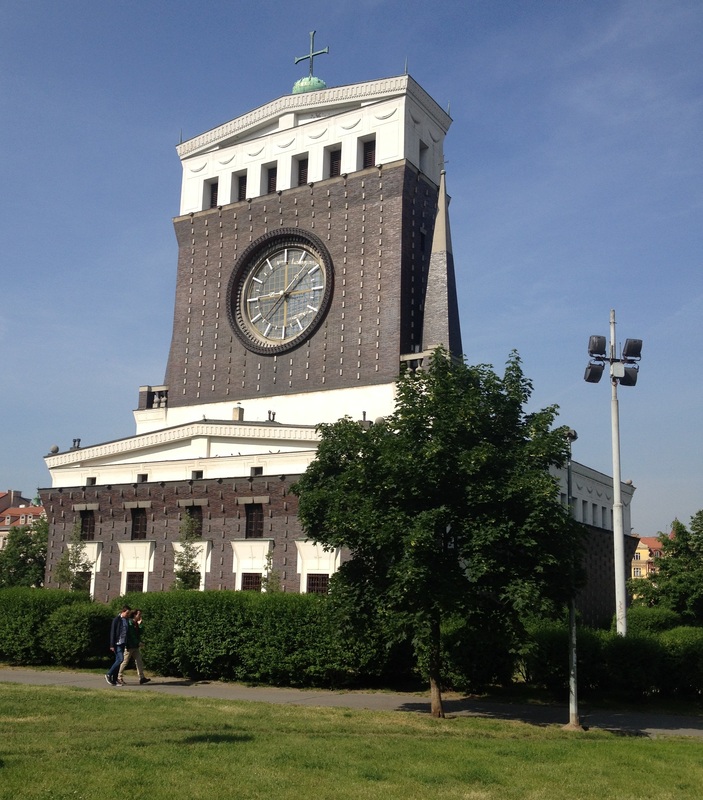 To visit the Museum of Clocks, though, you must travel to Bratislava, Slovakia (more on that in good time). As for dogs . . . did you know that the Czech Republic has one of the highest rates of dog ownership in the world? Well, now you do. According to the crack statistical staff at the European Pet Food Industry Federation (FEDIAF), 41% of Czech households own at least one dog, the second-highest rate in Europe. ** In the U.S., another dog-loving nation, the comparable figure is 36.5% (per the American Veterinary Medicine Association). Well-behaved urban dogs hang out in Prague’s parks, chill in cafes, patronize farmers’ markets and ride the city’s excellent mass transit system (with their own tickets). And, of course, they accompany their owners on vacation. 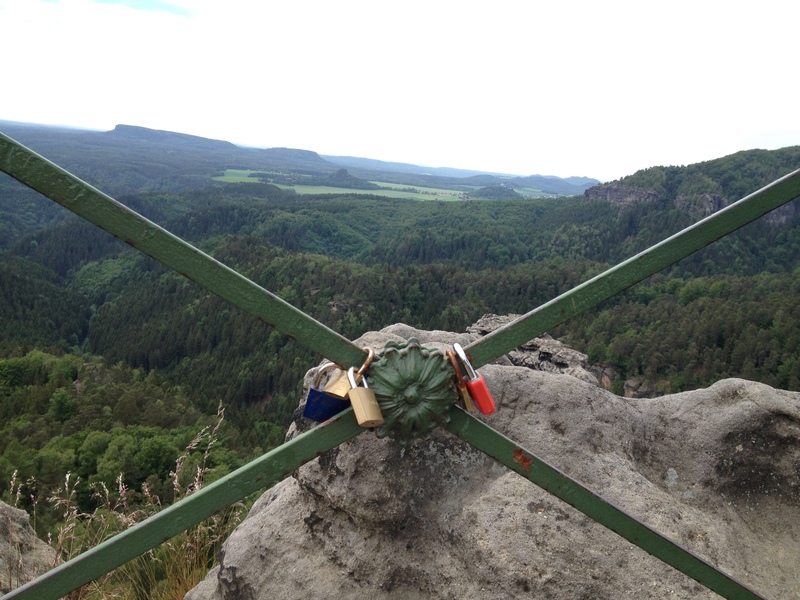 Our personal best dogs-on-public-transportation experience was five long-haired dachshunds on the Hřensko-Mezní Louka bus in Bohemian Switzerland national park. Smokers in Prague and throughout the Czech Republic, like our friend from the Czech Wine Promotion Authority, inhale proudly. They don’t skulk in the shadows the way they do in Brooklyn, or huddle miserably in the rain and cold. Nope: they order a beer (or wine) and something to go with it, lean back, and light up. Ashtrays are plentiful and non-smoking sections loosely enforced. Want to sit in the restaurant’s pretty garden? You will be wreathed in cigarette smoke. Finally: babies. I live in a notoriously fertile section of Brooklyn, and I have never seen a higher concentration of babies, young children and pregnant women than during our nine days in Prague. Eurostat is determined to make me a liar – their most recent (2012) figures show the total fertility rate in the Czech Republic to be less than the EU average – but who are you going to believe: a bunch of bureaucrats in Luxembourg, or a discerning resident of Park Slope? 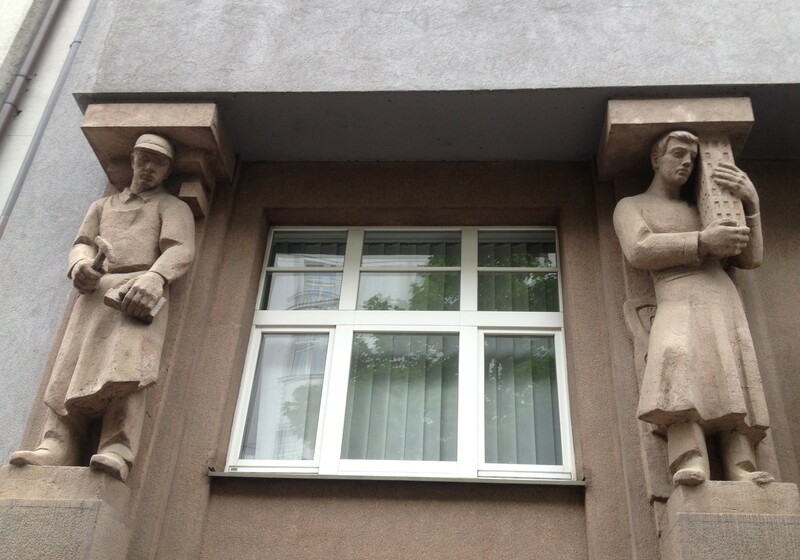 Prague has the hardest-working statuary around. The classic postcard image of Prague emphasizes red-tiled roofs and labyrinthine medieval streets. 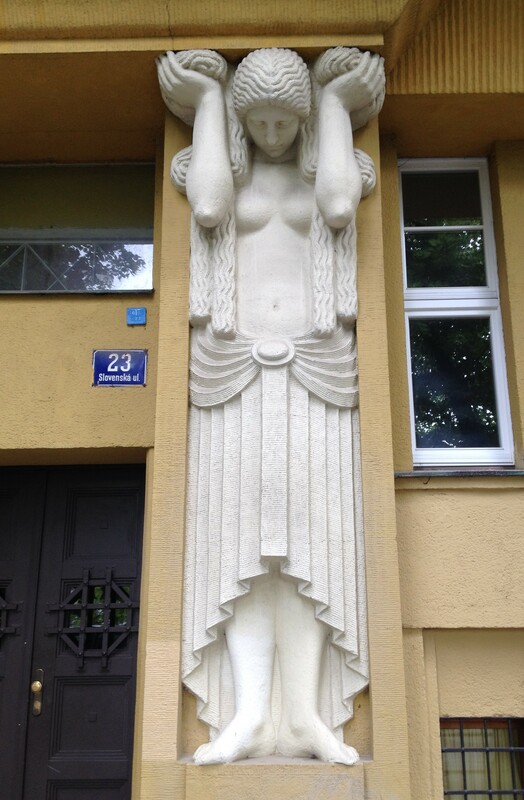 Perhaps because we spent most of our stay outside the city’s historic center, on the border of the Vršovice and Vinohrady neighborhoods, my first and most enduring image of Prague is of fine 19th and early 20th century buildings in the art nouveau style – with statues drafted into supporting roles. Even Prague’s pregnant statues do heavy lifting. Just looking at her makes my shoulders ache. In Bratislava, you can buy cheese from vending machines. At bus stops. Although we spent most of our time in the Czech Republic, it seemed only fair to venture south and east to Slovakia for a few days. The Slovak capital, Bratislava, is a delightful city with a pedestrian old town, the aforementioned Museum of Clocks, a castle, the stunning “Blue Church” of St. Elisabeth, bike/running paths along the Danube and . 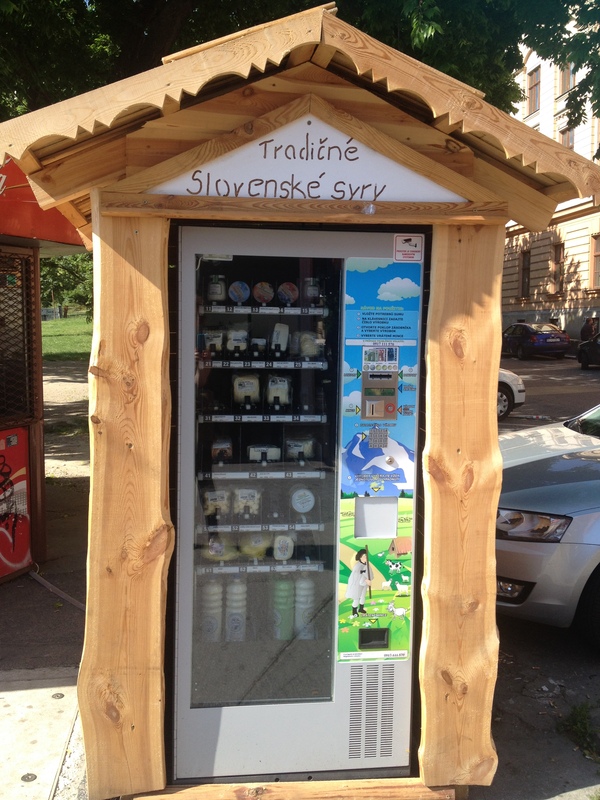 . . at the Zochova bus stop, a rustic vending machine from which you can buy yogurt, the tangy sheep’s milk cheese called bryndza, and other traditional Slovak dairy products. 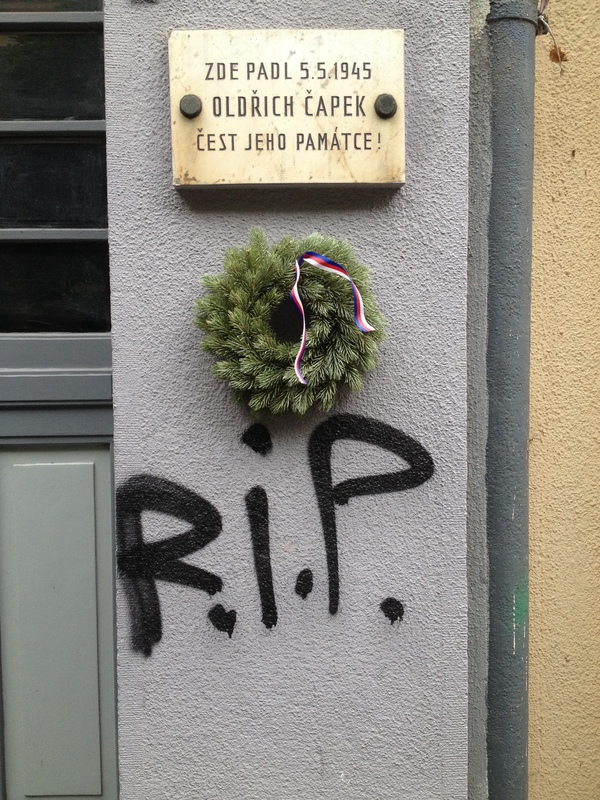 Bratislava, you are my kind of town. So much to parse in those sentences! There’s the laudable commitment to promptness, such that a delay of five or ten or fifteen minutes requires an explanation. There’s the allocation of blame by nationality (it’s not us, nope, not our own Austrian rail system) and the passive-aggressive vagueness of the reference to an unnamed “foreign country” (the train only runs between Vienna and Bratislava), culminating in a non-apologetic apology. Best of all was the fact that it was a recording, to be played and replayed as needed. Some concluding thoughts on historical memory. 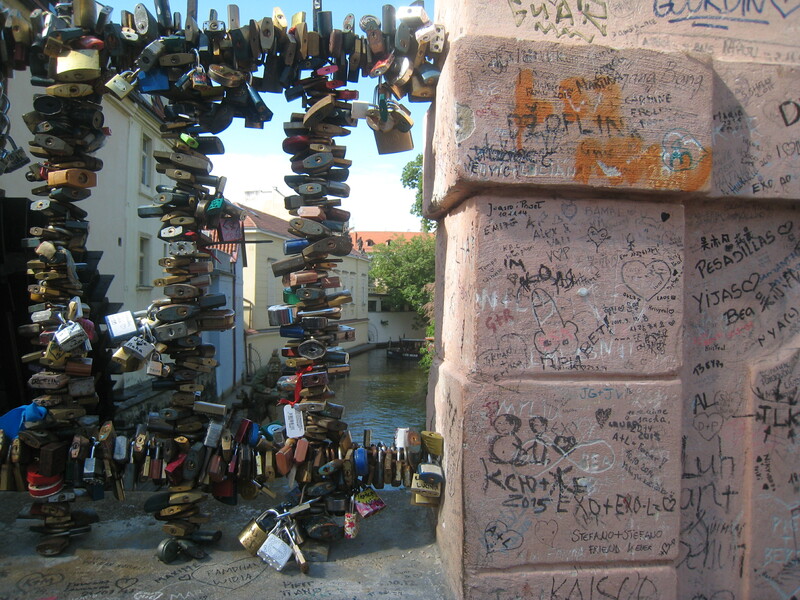 During our time in Prague, I thought a lot about historical memory. Despite my ignorance of Czech history, or possibly because of it, I was struck by the pervasiveness of the city’s confrontation with the darkest chapters of its past. Commemorations were both public and intimate, official and personal. 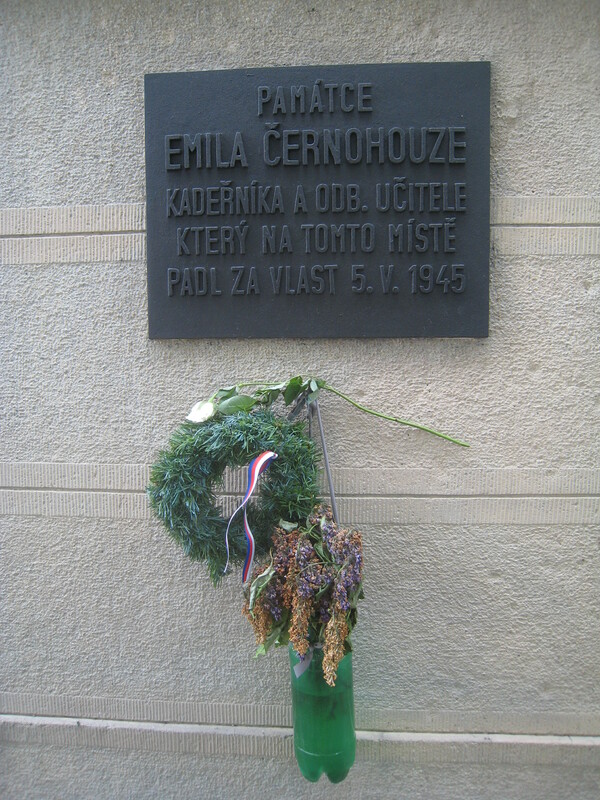 Throughout the city, wall plaques honor Czechs who died fighting the Nazis (most of the death dates are from the first week in May 1945, during the city’s final uprising before its liberation). 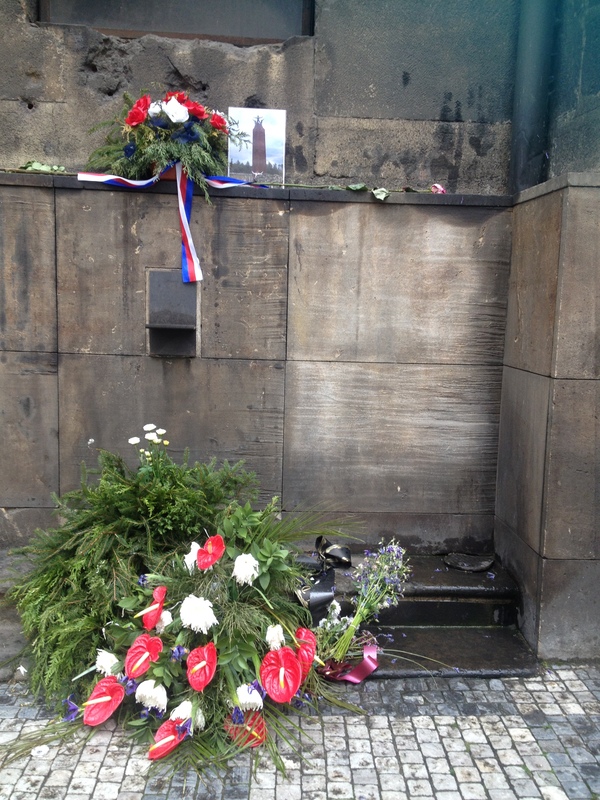 During our visit, virtually without exception, those plaques were decorated with wreaths and flowers. It’s possible this was an anomaly – had there been a push to hang wreaths to mark the 70th anniversary, a few weeks earlier? – but many of the flowers looked awfully fresh. In the New Jewish Cemetery, piles of stones marked the memorial (not grave, of course) for artists and writers murdered at Auschwitz. 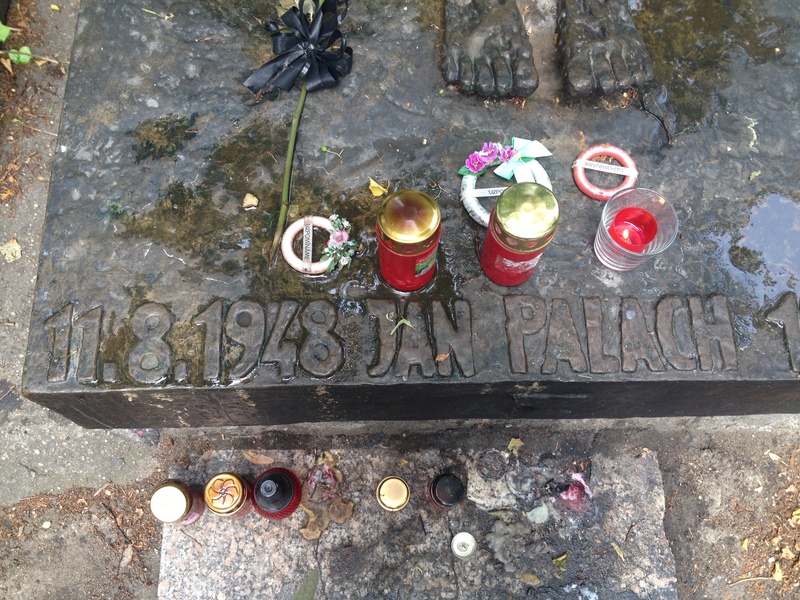 And in Prague’s vast Olšany cemetery, it wasn’t hard to find the grave of Jan Palach, the student who set himself on fire to protest the 1968 Soviet invasion that crushed efforts to build socialism with a human face. His is the one covered with flowers, tea lights and flickering red memorial candles. but, you know, it’s a start. *Note the use of English, including English language puns. I was surprised, but Katie wasn’t. Her theory is that English has become the lingua franca of hipster businesses, signifying a certain kind of breezy cool. **Romania occupies the top spot, with a 45% dog ownership rate. Rates in the low 20% range are more typical. This entry was posted in Food, Running, Travel and tagged Bratislava, Czech Republic, Prague, Slovakia by lkewing313. Bookmark the permalink. Cool shot of Church of the Most Sacred Heart of Our Lord, with clock. Thanks! When I first glimpsed the church, from a distance, the giant clock fooled me into thinking it was a train station.